For 27 years, Saul Nurseries has been known for introducing new plants and making them readily available to landscape professionals and garden centers in Atlanta and the Southeast. The wholesale nurseries consist of two rewholesale sales yards and two production facilities. 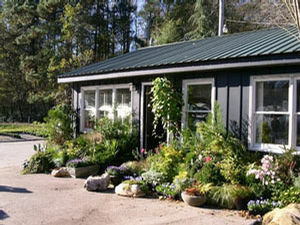 Customers visiting the Atlanta sales yard, fondly known as 'The Swamp,' or the Alpharetta sales yard, see new styles of landscape and container design as well as effective use of plant texture, color and form. Because of its reputation for quality, professionalism, and plant knowledge, Saul Nurseries was selected to design and plant 800 containers for the 1996 Olympics, as well as many other projects such as highway plantings using native perennials, wetlands reclamation and greenroofs. The nurseries' plant selection of over 2000 varieties includes: annuals, tropicals, perennials, succulents, natives, ornamental grasses, ferns, water plants, woody ornamentals, greenroof plants, and collector plants. Regional deliveries are available. Please call us for more information. 1115 Curry Drive 1280 Union Hill Rd.